There are so many wonderful issues of newspapers available online through digitization projects and archives. Some are funded through library, college or institutional initiatives and others are because of a personal passion. We’ll try to narrow down the focus each month to a particular theme or topic, even a year or a decade. In doing so, hopefully we can see a bit of ourselves in the way people were in the past, and also have some fun. Old newspapers demonstrate that there have always been things like cartoons or “memes” and social media. Stories about what everyone is doing, have done, or will be doing. There’s rants, gripes, politics, hate speech, bad jokes, puns, insane occurrences of freak accidents, tragic diseases and even the occasional foodie binge. When you spend time reading old newspapers, you’ll see that people aren’t all that different today than they were, say 100, 150, or even 200 years ago. There are just different means and technology to convey the culture. Today we have new ways to transmit news and all of the really weird things it means to be human. 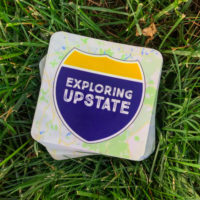 As we explore Upstate through its news of the past, let’s all keep that in mind. We are wearing these meatsuits for only so long, so let’s try to keep some levity to it. But, know life is serious and that means exploring and having fun is all the more important. As March is recognized as Women’s History Month, much of the focus for this edition will be on women. To focus that a bit more we’ll keep the clippings from the month of March. These highlights are from 1919 and offer an interesting glimpse into how women appeared in the news 100 years ago. 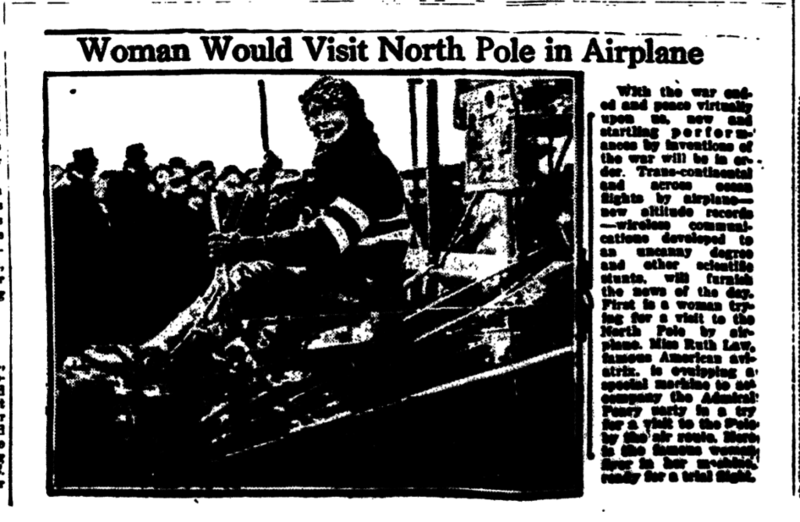 Ruth Law used a New York built Curtiss plane in a 1916 flight from Chicago to NYC. Law has been viewed as one of the most pivotal aviators in post WWI flight. Glenn Curtiss refused to build her a larger plane with bigger fuel tanks for her flight citing war use of metal as well as his opinion that the plane she wanted was too much to handle for a woman. Despite that, she successfully made the trip with some necessary refueling hops. 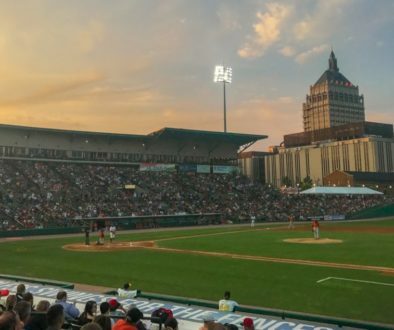 In just about every newspaper across the state from the mid-1800s to well into the 20th century, the social columns were chuck-full of who is who, who is where, and who is visiting who! Think of it as your FourSquare or Facebook Check-In but printed in ink not html. Women’s social events also often conveyed larger movements. Women were extremely active in supporting war efforts, as well as other community support events and even political reformation. 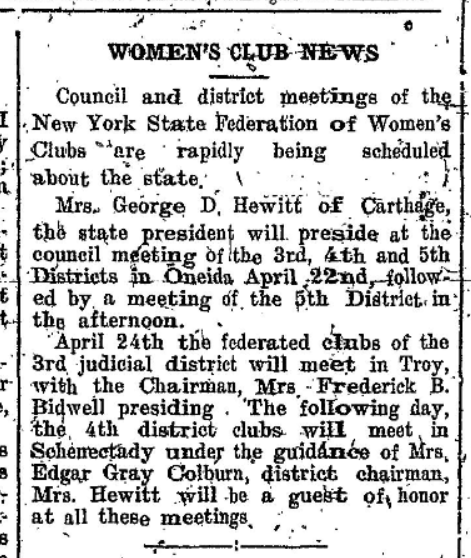 Leading into the last surge of protest for women’s national suffrage, social columns in newspapers often highlighted the who’s who of a community. They can provide a wealth of knowledge about who transformed communities as well as New York State. Then again, sometimes they just tell you that a Mrs. SoAndSo was pretty good at playing euchre. 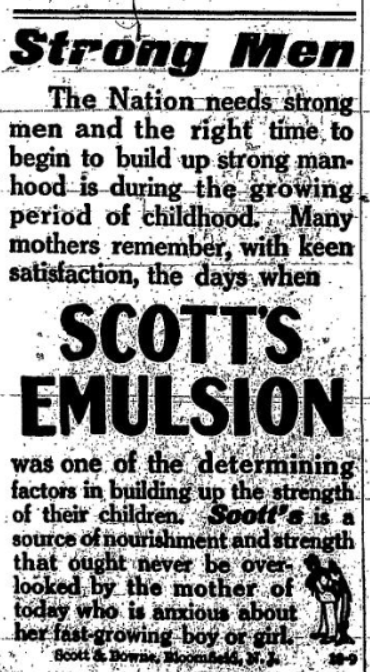 One of the surprising aspects of women’s rights in old newspapers can be seen in the advertisements. 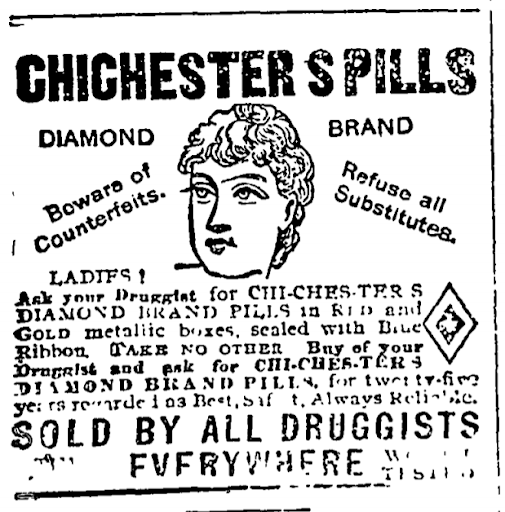 From Tansy Pills and ever present Chichesters Pills, what was openly displayed in the paper seemed to be hidden behind verbiage and euphemisms that can be lost on modern readers. The ubiquitous nature of these products even meant that often their purpose didn’t need to be explained. Before the norm of established birth control prescriptions, women had to turn to products that had – much like many other “remedies” of the time – no health agency oversight. Chichester tablets were intended to control menstrual cycles, thus discomfort and even unwanted pregnancies. Tansy was an age old “cure” for womanly issues, and in high doses was an at home “day after” pill that could be taken well beyond the next day with effective results. Some women no longer had to worry about any of that. When it came time for that “Change of Life” there were plenty of other remedies to pick from. Many herbal formulas of the past were a grand combination of old school medicinal plant knowledge and a heavy handed dose of high proof alcohol. Either way, gramma was probably lit while she knit. The ads for medicines directed at women weren’t always for their own consumption. Historic newspapers are full of remedies for a slew of ailments, real and imaginary. 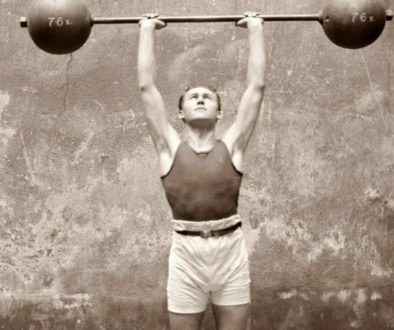 Several products were offered for imbalances and constipation, liver problems, and mucus. Yeah, a LOT of mucus ones. We’ll explore in the next edition some of the ads for “Male Vigor”. But this one that calls out women as mothers to provide “Strong Men” for the nation (yes, right here in America) is another example of targeting females with ads. If we look at it just right, that means their increasing consumer potential. With consumer power, that also reflects that women are increasingly joining the workforce. Still in an era where most women were expected to be housewives, only working until they found a suitor that would marry them, help wanted ads for women in the early 20th century grew in number. 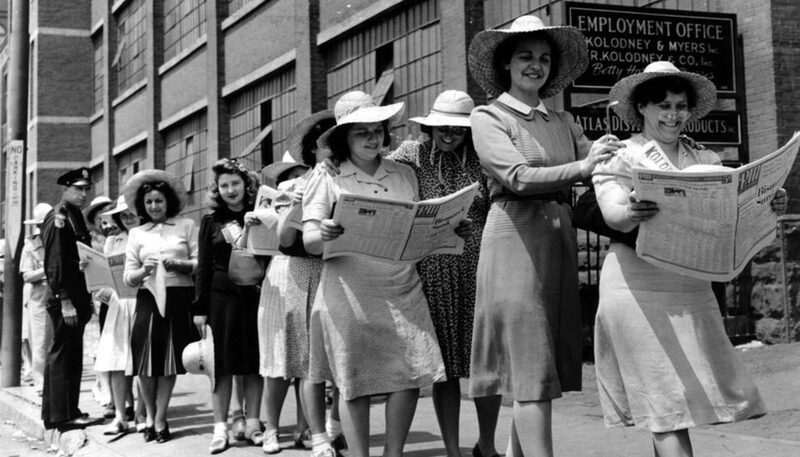 During another post-war bump of women in the workplace, the Manhattan Silk Company offered good wages as well as other social benefits to their workers. 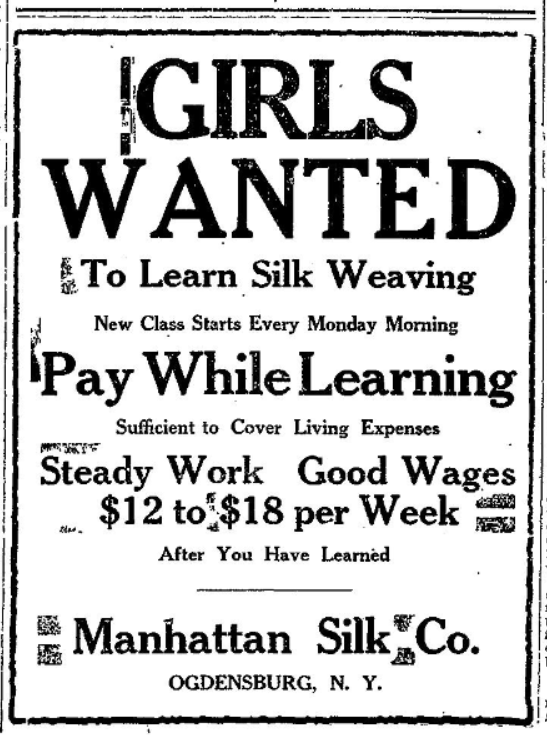 Other ads Manhattan put out give a laundry list of reasons for young women to work there. They included everything from a safe environment, to good wages, training, and at least bi-annual banquets. Often this increasing role of women in the workplace was newsworthy, as the case of Elizabeth Taylor illustrates. At least this Elizabeth Taylor was to see the inside of a courtroom as a stenographer and lawyer, not because of more than a half dozen divorces. Some papers such as The Whitesville News (March 13, 1919) devoted sections to “The Home and Household – – Woman’s Page”. Encouraging indeed, and also during the moments leading to national women’s suffrage (NYS had passed legislation upholding the right of women to vote in 1917). 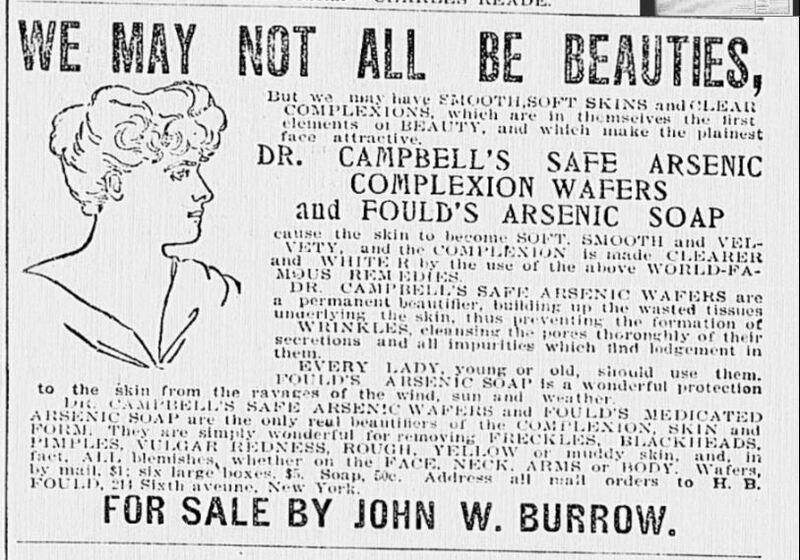 Then again, this same edition of The Whitesville News had some pretty misogynistic articles and ads on other pages. As much as the times where ‘a’ changin’, one advertising truth remains the same. Products that take advantage of a person’s insecurities always seem to sell – regardless of the harm they will result in. Selling everything from arsenic to radium, we’ll explore that a bit more in a future edition. David Brooks has an American History degree from the State University of New York. 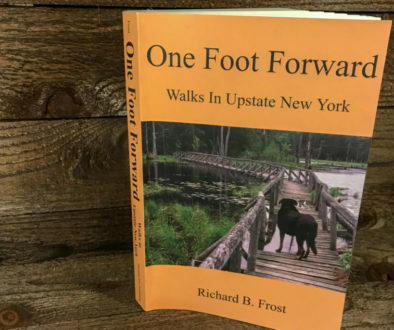 He currently lives in Northville along the banks of the Great Sacandaga Lake. 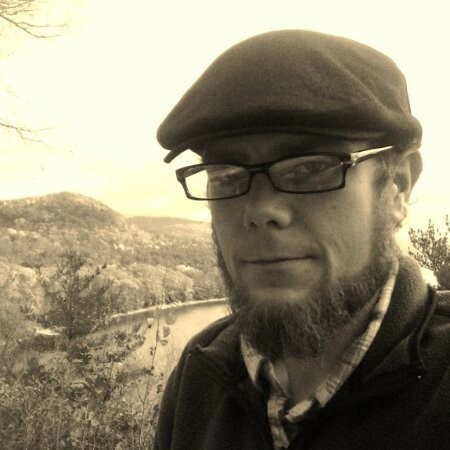 He serves as the Education Director for the Schoharie Crossing State Historic Site and on occasion can be found exploring the Adirondacks hoping to catch sight of Big Foot. Thanks to a number of great contributors, Chris gets a break occasionally. 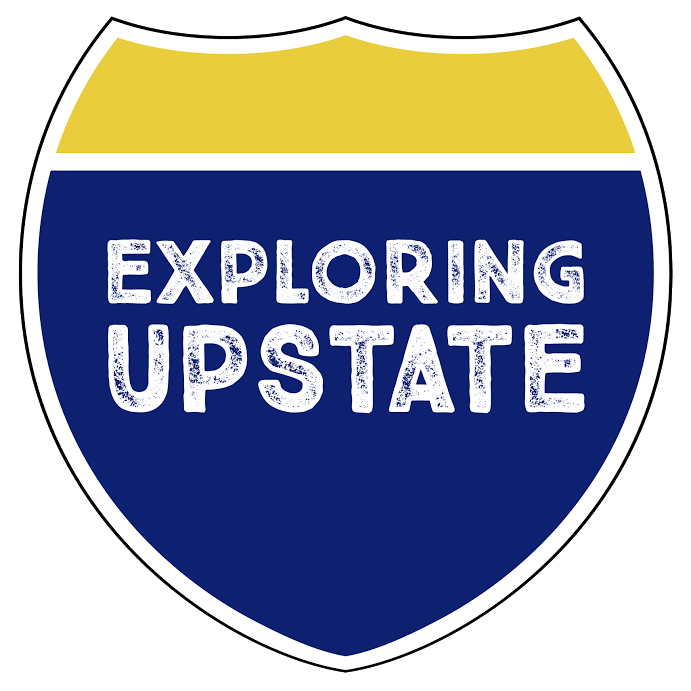 For more about past contributors to Exploring Upstate, checkout the "Meet" link under "About" in the main menu.